In Procrastination I believe! This time I will not crib over how I’m posting March favourites when it’s time for April favourites…you already are aware of that. So let’s keep the fun of procrastination alive and not get judgmental. Summers are here…so just relax, sit back, sip some Ice tea (I prefer Nestea, saves time!) 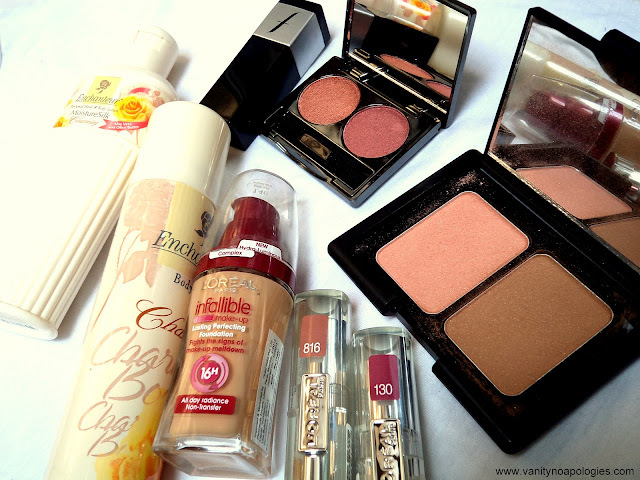 and I will show you my most used products from last month. 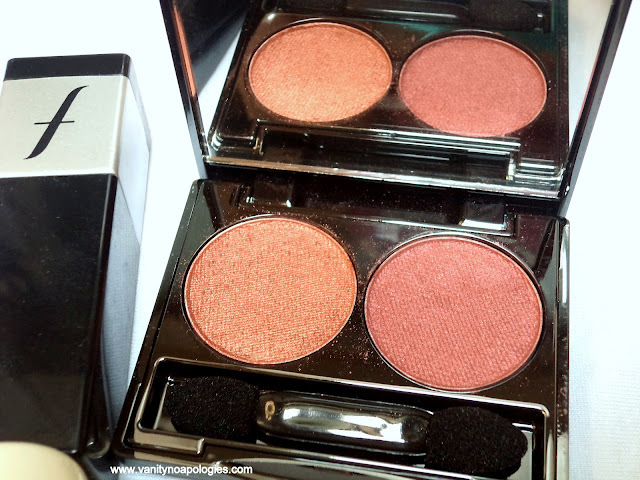 Faces eyeshadows in Amber Duo: Pretty colors that go well with Indian outfits. And since its the wedding season, they are being used a lot. Faces Kajal: I hoard every kohl out there. I have Lakme, Vlcc, Himalaya, Hashmi, Lotus Herbals and now Faces…and many more to come! and yes this one smudges much less, but I’ve not yet tried in the hot Delhi summers. Elf Blush and Bronzer Duo: My first ever Elf! 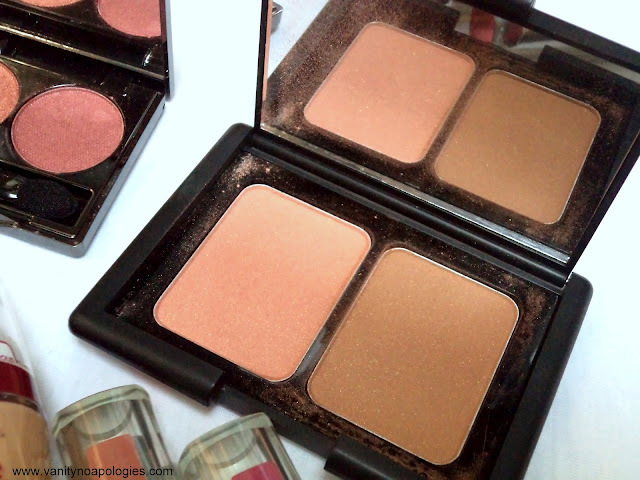 The duo is not much pigmented but impart a nice glow. Will be reviewing this one soon. 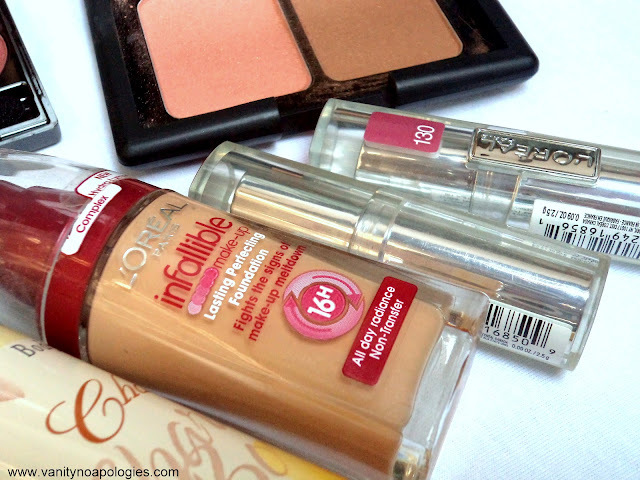 L’Oreal Infallible Foundation: A long wear foundation with heavy coverage. Apt for late night parties. Been wearing this to the weddings this season. Review coming soon! 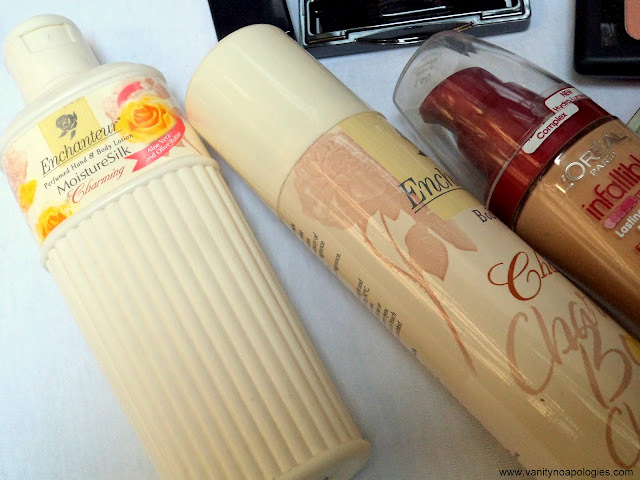 Enchanteur Body Lotion and Body Mist: I luuuv layering..be it clothes, makeup or fragrances! So I wear these two together to make the fragrance last longer. I just wish they had a shower gel to compliment it! These are some inexpensive fragrances which smell nice. My favourite is Romance. I know I know I always say “review coming soon” and they do come but not that soon! So this time I will not say BUT do…promise! April is already coming to end, so look out for April Favourites “soon” ha! I wanna check out the maybelline kajal!!! Where did you get ELF from ? Is it available online in India ? I have heard a lot about this duo.. I like faces eye shadows in the pictures. i might buy it. Not an eyeshadow person but something which can make my eyes look alive is always welcome!! Loved seeing all the favorites in one place!! hey:) do u have a review on this particular loreal foundation? i checked it in the store the other day but was not sure of it! Hey Ansh does that foundation hides imperfections very well without making cakey face and let me know if its oil-free and from where bought elf products?? Is it available in India?